Most small investors cringe at a bear market when it seems like all stocks are in a steady decline. There is, however, a technique to profit from falling stock prices called "selling short", or short selling. Essentially, short selling is a type of order in which an trader sells borrowed securities in anticipation of a price decline and is required to return an equal amount of shares at some point in the future. Understanding a short sale may be difficult at first, so let's use a simplified example to help explain it. Suppose you believe that shares of Microsoft Corporation (Nasdaq: MSFT) are overpriced and are likely to decline in the future. In order to profit from this expected price drop, you'll need to short MSFT stock. To do so, you borrow shares from someone else (your brokerage facilitates this) and then immediately sell them on the open market. Suppose you short sell MSFT at $60 per share today, and in two weeks time it is trading at $50 per share. At this point, you "cover" your short position by purchasing MSFT shares and returning them to your lender (your brokerage). 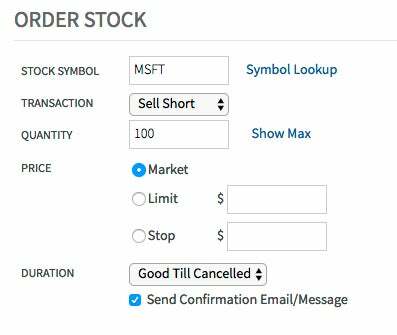 Since the stock's price fell, you will profit by $10.00 (not including transaction costs) for every share of MSFT you shorted (Read our Short Selling Tutorial for more details on short sale trades). As you can see, we want to make our Transaction type a Sell Short for 100 shares of MSFT at the current market price. In other words, we are telling our broker we wish to borrow 100 MSFT shares from them and sell them immediately at the current market price. Click on Preview Order and then Submit Order to confirm your short sale instructions. Basically, your "shorted" stock holdings are reported in your Portfolio Summary in the same way as the stocks you own (your "long" positions), with the only difference being the gains and losses reported for your shorted stocks are opposite in nature to your long holdings. This means that as the price drops for a stock you have shorted, your gains will increase. In our next section, we will explain the necessary steps on how to close or "cover" your short position. Short sellers enable the markets to function smoothly by providing liquidity and also serve as a restraining influence on investors’ over-exuberance. If more people understood short selling, it would invoke less fear, which could lead to a more balanced market. Short selling a stock means you are betting on the stock decreasing in price. Before taking on this investment, you should fully understand the risks. Short selling has a number of risks that make it highly unsuitable for the novice investor. The media demonizes naked short selling, but it usually occurs after a collapse, not before. Short sales work well in bull and bear markets but strict entry and risk management rules are required to overcome the threat of short squeezes.